So Field Camp had just ended and I met up with Mandy to do some hikes in the San Juans. 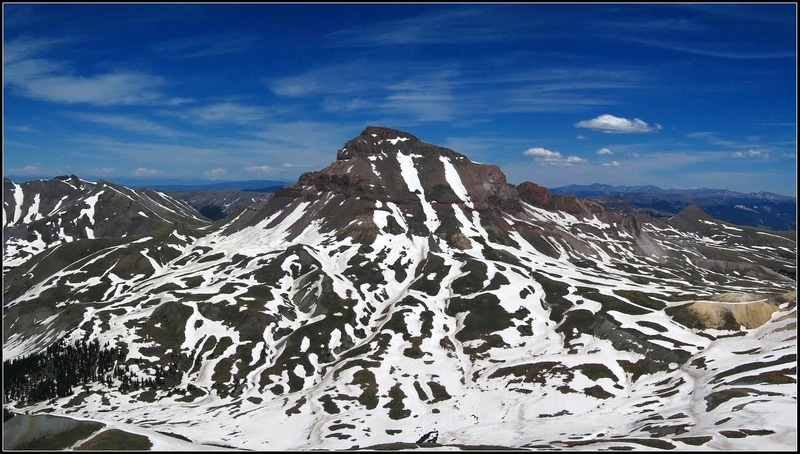 Our first peaks we wanted to do was Uncompahgre and Matterhorn. Uncompahgre is the highest peak in the San Juan Mountains at just over 14,300 feet. It was June 26th and we drove to the Matterhorn Creek Trailhead in my little beater car and made camp. The next morning we started up the wet and muddy Matterhorn Creek Trail. There was still loads of snow around from the very wet winter but it was nice and firm. We continued up the snow covered trail in good time and made it to treeline shortly after sunrise. The view of Wetterhorn was amazing. It was strange that only a year and a half ago I thought Wetterhorn was too hard for me to climb. 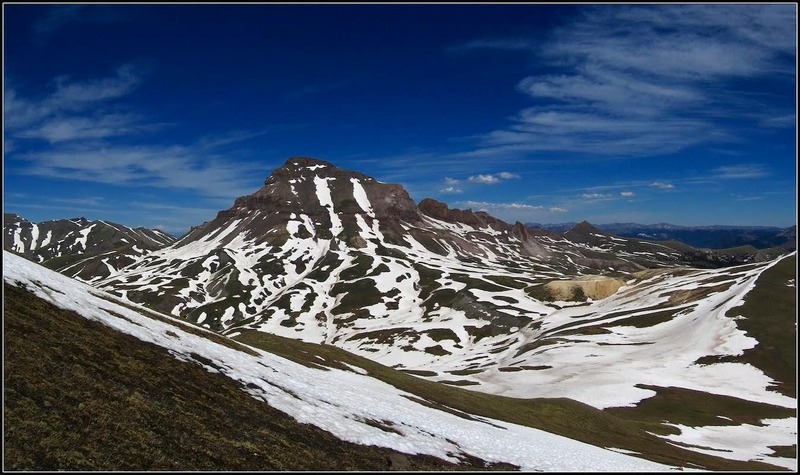 We reached the saddle where our first views of Uncompahgre were seen. I remember thinking WOW that is one big mountain for Colorado standards. Mandy and I descended slightly to the other side and agreed to hike around the mountain to the standard trail route. The snowfields we crossed along the way all began to soften and we started to sink deep into the snow. But we soon managed to get to open grassland with all the snow melted. We ascended the standard route and saw some others on the way. We reached the large flat summit area after a short scramble. You could house an army on the summit! We decided to take a shorter descent route and descend the southwest couloirs. This was the way I wanted to go up but Mandy urged otherwise. 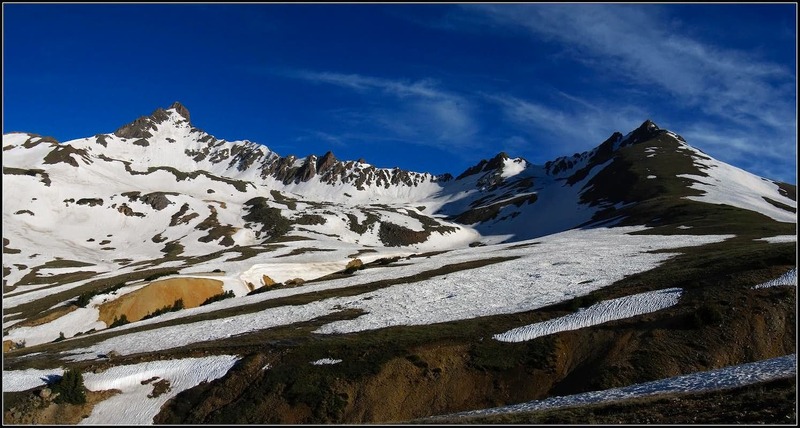 Since they were not as steep as we thought, we carefully down-climbed and glissaded the snow to the basin below and returned on the trail back to the saddle. We really started to post-hole now. Once at the saddle, Mandy waited as i ran up Matterhorn and made the easy (well, I thought it was a challenge at the time!) scramble up the summit block. Nice views of Uncompahgre from here. I returned down and we hiked out to the car.